The HW520 EncorePro is the latest generation of corded headsets from Plantronics. It can be used with desk phone, computer or mobile phone (each requires the right connector cable). It is both wideband and noise cancelling - this combination of great value, fantastic sound and proven ruggedness have made it a hugely popular headset with businesses of all sizes. The HW500 series comes in a range of wearing style - 510; over the head, one ear, 520; over the head 2 ears, 530 earhook style, 540; over the head, earhook AND neckband styles included. If you like the over the head (headband) style the 510 and 520 will be the durable. This EncorePro model is the mid-range from the hugely popular Plantronics suite of headsets. The microphone features noise cancelling to ensure no distracting background noises are transmitted to your callers.This is a wideband headset which means it offers the most natural sounding voice clarity but bear in mind that this is only if both you and the person calling you are on wideband phones, in which case it will just offer just standard narrowband. Corded headsets are pretty rare outside of call centres these days - most people prefer the freedom of a wireless headset and starting at less than $200 it's hard to say they are too expensive! A wireless headset can make you more productive - grab a quick cuppa whilst you listen to your caller, locate a file or resource whilst building more rapport - you can understand why businesses have moved away from corded headsets! As with any corded headset, with the 520 you are connected to your phone via a cable, this can be frustrating when wires lie across your desk and get in the way of papers or drop down and get crushed & tangled under chair wheels. In addition, don’t forget to factor those additional costs when budgeting. You may even need an amplifier – if so, a wireless headset will probably work out cheaper than a corded one. If you don’t have a headset port on your phone, a corded headset will take the place of your handset. If you still want to use the handset you can pick up a switch to allow you to swap between the two, but really, at that stage, you’ll probably want to pay a few bucks extra and get a wireless headset. A wireless headset will let you use the handset or headset, regardless of what sockets you have on the phone. Plantronics have brought out what will no doubt be another best selling headset and there will be nothing wrong with it. Arguably other brands can give you better value for money or better quality but just like it's predecessor, we're pretty sure this headset will fly off the shelves. Should you prefer a Sennheiser brand equivalent, the SH 260 is our top pick corded headset and certainly worth a look. The Jabra range (the other big name in headsets) also offers a smart cable which will provide a compatibility solution for the majority of phones. 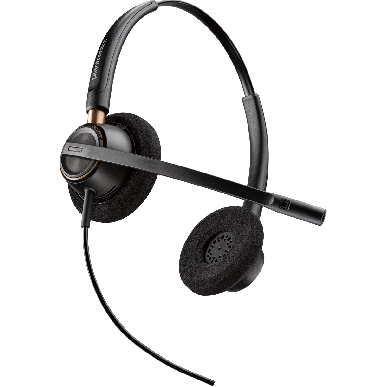 Have a look at the Jabra Biz 2300 Duo Corded Headset for a robust, quality solution equivalent to the Plantronics. If staff sit close together and it’s really noisy, the ultra noise cancelling of the CC 520 is definitely worth the extra investment..
Another factor to consider is the extra productivity that can be gained from the freedom to walk away from your desk while on a call. It is worth checking out the Plantronics CS520 which is the wireless equivalent of the HW520. Whether you work in a busy office or customer service center, the stakes are high with every call. Introducing the Plantronics EncorePro 500 headset series – designed to give your team the quality, power, and confidence to perform – every time. Each of the three innovative designs in the series incorporates all-day comfort, superior noise canceling technology, and long-term reliability. It’s a win-win with next-generation performance for your team and your customer. The EncorePro 500 headset series balances all-day comfort, superior noise-canceling, and long-term reliability in three innovative designs. Your team will feel the improvements and customers will hear it. 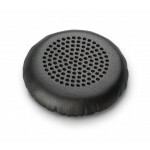 The Quick Disconnect feature provides walkaway convenience and compatibility with all Plantronics USB, desk phone audio processors, and direct connect cables. 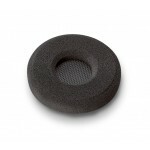 Flexible noise-canceling boom allows optimal positioning for voice clarity. Visual and tactile positioning guides enable precise and quick microphone positioning (HW510/520). Wideband audio delivers richer, clearer conversations and reduces listening fatigue, while SoundGuard technologyprotects from noise spikes, helping to meet OSHA/Noise at work requirements. On all counts its 5, for Value for money ; Ease of setup ; Ease of use. Feedback from the call centre staff and the supervisor has been excellent and I would rate them 5 in all areas. The staff are extremely pleased with them. Initially we did have some comments from a couple of staff saying that perhaps we should have got the headset with just one earpiece rather than having them on both sides but those concerns seem to have gone now that they are used to them. They have improved the quality of the calls tremendously. The only issue we had was in the delivery of the Headsets but we managed to get around that.